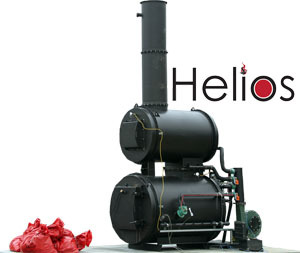 Helios (formerly known as Vulcan) Small Scale Incinerators are a reliable way to dispose of solid waste, pollution, drugs, trash, medical waste, and other contaminated materials. Designed as a reliable small scale system, these incinerators are commonly used for general site refuse, evidence disposal, and solid waste disposal. Models include the Helios 0.3 Dual Chamber Unit and the Law Enforcement Little Helios Drug Barrel Burner. All	portable and	small incinerators are made in the USA. Visit our page explaining the different uses for drug disposal, including law enforcement. Units that combust contraband or prohibited goods: Your incineration unit is excluded if the unit is owned or operated by a government agency, such as police, customs, agricultural inspection, or a similar agency, to destroy only illegal or prohibited goods such as illegal drugs, or agricultural food products that can not be transported into the country or across state lines to prevent bio-contamination. The exclusion does not apply to items either confiscated or incinerated by private, industrial, or commercial entities. Small Scale Dual Chamber Units, also known as Fixed Hearth Units, are a great option for locations looking to dispose of small amounts of waste or for locations needing to meet specific emission requirements. Learn more about small Scale Incinerators and Portable Trash Incinerators. Read a little about EPA Incineration Guidelines. Dual Chamber Small Scale Incinerators work by incinerating materials first in the primary chamber and then oxidizing by-products from that chamber for a second time before emissions enter the atmosphere. Click to view the Small Scale Dual Chamber/ Helios Fixed Hearth Incinerator Product Flyer (PDF). Can an incinerator burn electronic media? Visit our incinerator FAQ page to find out. Medical Waste Incinerators are a favorite for clincis and small hospitals on islands or remote locations. Incinerators have been successfully used for waste from hospitals, clinics, labs, veterinarian offices and more. Read more about medical incinerators and emission comparisons. For some police stations, drug and evidence disposal may require a larger scale operation. Review our economical incinerator ideas. For these areas, small dual chamber incinerators can help to safely dispose of evidence from multiple counties or for large scale disposal requirements. For more information please view our portable incinerator for drug disposal or Portable Incinerator to Destroy Drugs pages. Questions? We can help! Call GEI Works at 1-772-646-0597 or fill out our quote request form to discuss your requirements. EPA Standards of Performance: For New Stationary Sources and Emission Guidelines for Existing Sources: Hospital/Medical/Infectious Waste Incinerators. Helios Comparison Chart: Click for a Comparison Chart of the Types of Helios Incinerators. Types of Waste: Learn the Types of Waste for Combustion and how they are classified. Environmental Monitoring Technology: Guarding Data Acquisition System. Learn more about incinerator emissions by visiting our air permits for incinerators page. The Resource Conservation and Recovery Act (RCRA) was enacted by Congress in 1976 and amended in 1984. The act's primary goal is to protect human health and the environment from the potential hazards of waste pollution disposal. In addition, RCRA calls for conservation of energy and natural resources, reduction in waste generated, and environmentally sound waste management practices. A close second to recycling, combustion has proven to be very viable for Municipal Solid Waste (MSW) reduction and has helped reduce the amount of landfill space needed. Large Combustion facilities now burn MSW at high temperatures, reducing waste volume, generating electricity, and providing heat. We have adopted the same proven system with our small scale incinerators; we can create free heat to warm a building with our Heat Recovery Unit. It's easy to use, too. Simply install a Heat Recovery unit outside, where it pulls in fresh, clean air, and passes through the heat exchanger, then the powerful air blowers force the air into existing ducting to warm your building! View Commercial Incinerators Overview Page.